As a young girl grows older, her tastes start to change and reflect her budding personality. High school dances, first jobs, preparing for college- these are the milestones that will shape her life. While she navigates her teenage years and approaches adulthood, create a place of her own she can turn to at the end of the day and reflects her new sense of self. Black and white bedding offers the perfect way to combine style with youthful touches. Here are some gorgeous black and white bedding sets your teenager is sure to love. When decorating in black and white, a few pops of color can make a bold impact without being too overwhelming. This leopard print comforter from Cosmo Girl features a ferocious black and white pattern with a bold injection of neon hues. Play up this wild bedding set with bright room accents. Not for the shy at heart, this fierce comforter from JLA Basic is for the modern young woman with fearless taste. Showcase the classic zebra stripes with solid black or white sheets to keep the focus on the animal print. If you find the color scheme too plain, spice it up with room decor , like rugs and throws, in rich shades. Though teenage girls are starting to develop mature tastes, their bedrooms should still reflect an air of youthfulness. Keep their bedding fun with a pop of color, like with this bedding set from Mizone. The energetic teal shade pairs perfectly with the sophistication of classic black and white. Have an indecisive teen on your hands? Satisfy her shifting design sense with reversible bedding. This comforter set from Student Lounge features two styles in a tribal print: classic black and white and eye-catching orange and magenta. After all, a girl can change her mind! Have your teen fall asleep in this gorgeous damask set from PB Teen and she’ll have sweet dreams every night. The intricate floral print will be right at home in a room with romantic decor, so tailor this bedding to the theme with a ruffled throw and pillows. Create a room fit for a queen with this black and white set featuring royal purple. This set from Cosmo Girl features a large-scale leaf print that will liven up the plainest of bedrooms. Display this set on a dark wood furniture set to create a luxurious feel. Patterned comforters are an easy way to introduce pattern in a room without committing to more permanent decor, like wallpaper. This scalloped pattern comforter from PB Teen becomes the centerpiece of the bedroom with its bold use of a black and white print. The rest of the bedding simple to prevent a chaotic visual- solid accent pillows and sheets keep the look polished. 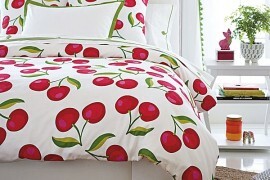 This bedding set from PB Teen is perfect for the teen with simple but stylish taste. Speckled pom poms keep the comforter from being too boring. Layer the pillows and sheets for a plush sleeping experience. These bedding sets show that you can have a classic sense of design style while still paying attention to trends. Which one of these sets do you like most? Tell us in a comment below.